Since Saturday’s Umno Kubang Pasu division delegates meet, where Dr Mahathir Mohamad failed in his bid to get elected as a divisional representative, some 50,000 copies of a pro-Mahathir tabloid, Putra Post, has been circulated in major towns and cities in Peninsular Malaysia. Reception to the inaugural edition has been so good, claimed a source, that a further 20,000 copies will be printed. Since early Saturday morning, the copies of the bi-monthly tabloid have been distributed within the Klang Valley, Alor Setar, Ipoh, Pulau Pinang, Kuala Terengganu, Kota Bharu, Arau and Seremban. The Malay-language tabloid was supposedly created to publicise political developments surrounding the former premier ever since the falling out between him and Prime Minister Abdullah Ahmad Badawi began late May. The Post was also intended by Mahathir supporters to provide information to rural residents, who might not have access to the Internet. 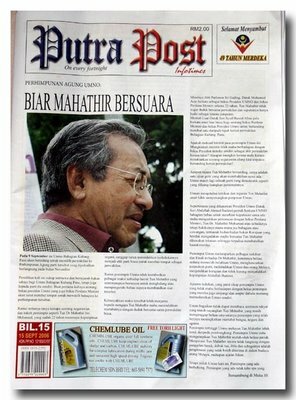 The publication process is being co-ordinated mainly by the Gen M (Generation Mahathir) club, and is allegedly funded by businessmen with close ties to Mahathir. Each copy is being sold for RM2.50. PM Abdullah Badawi - "I'll Do It My Way"
Opinions expressed here do not represent the views of Tun Dr. Mahathir Mohamad.